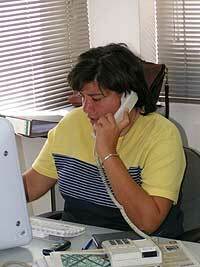 Rana Husseini at her desk at The Jordan Times. Photo courtesy of Alasdair Soussi. When a young female reporter joined the staff of The Jordan Times in 1993, “honor” killings were a dirty secret, a subject conveniently ignored by the masses. No one spoke of the cruelty that surrounded such deaths, or of the women whose lives were brutally and wantonly cut short. Indeed, in a society dominated by masculine principles, they were, in essence, Jordan’s forgotten victims. For Rana Husseini, however, then newly assigned to the paper’s crime beat, “honor” killings provided a suspiciously uncomfortable amount of copy. And not content with just glossing over the issue, she took on the mantle of uncovering this silent but deadly aspect of Jordanian life. It was only after The Jordan Times published her story, retaining all the undesirable details of the case, that she realized the strength of opposition that existed in Jordanian society toward the public disclosure of such crimes. According to official figures, “honor” killings reportedly claim at least 25 lives each year in this country of 4.8 million, one of the highest per-capita rates in the world. This view, and other similar opinions, Husseini says, made her furious, and propelled her to find out the truth behind these killings, which, say analysts, have their roots in local custom, not Islam. She visited court proceedings and analyzed the manner in which vulnerable women were treated by the judicial system. The next few years saw Husseini take the lead on many public awareness campaigns, where she attempted to both change people’s attitudes and amend the law — a move which earned her the Human Rights Watch Award (2000) and Reebok Human Rights Award (1998). Husseini, a born and bred Jordanian, gained both her Bachelor’s and Master’s degree from Oklahoma City University, before returning home and taking up employment at The Jordan Times, the country’s only English-language daily. Husseini’s years abroad, however, gave rise to accusations that she picked up “foreign” ideas about women in America, though such criticisms have been strongly contested by various high-profile figures who have thrown their weight behind Husseini’s campaign. Husseini is encouraged by the positive results yielded by her and her fellow comrade’s activities — the government’s introduction of the Family Protection Project in 2000 being one such triumph — and is optimistic about seeing a significant decrease in “honor” killings within the next 20 years.